After studying Multi Media Design I followed a bachelor for Theatre Technician with a specialization in Light Design and the use of Video in theatre. After that my interests shifted a bit to the question of ‘Why do we use new media in art and theatre’. And that’s were my interests are still are, after finishing the BA Media & Cultuur at the UvA last year. My first thesis was about the use of video in art & theatre. The second one was about the shift that sometimes artists are using new technologies that later on are used on daily bases by everyone, like augmented reality and locative media. Now at the New Media Master course I’d like to go a bit deeper into the theoretical aspects and apply it to interactive (new media) installations and theatre. 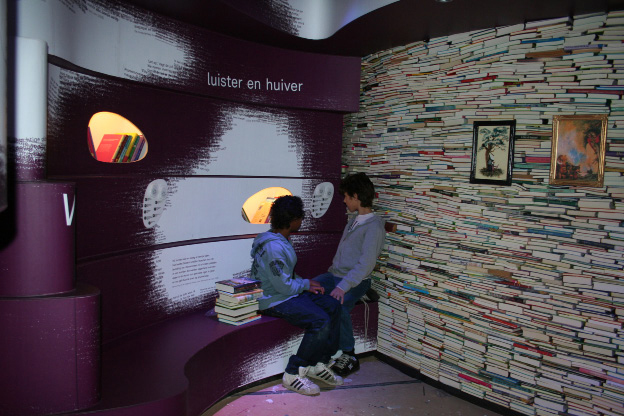 In The Hague there is the Dutch Children’s Books Museum (Kinderboekenmuseum). On the 8th of December 2010 was the opening of the new exhibition called Papiria. Within the new exhibition children with the age of three trough thirteen, learn about the way stories are written, what is important for telling a scary story or a love story. They discover what kind of story lies in them. The exhibition is a multi media project with a lot of new media techniques like RFID tags and multi touch screens. For this blog post I interviewed Annelie Grob of Grob Enzo, who was the project leader of this completely new exhibition. She was responsible for the new museum, with all the side projects like education, theatre and lecture rooms. The project started already in the beginning of 2008 and finished as told before in December 2010. What was the status of the ‘old’ museum? It was a museum with 20 small rooms at a gallery, where people could see things in display cabinets and sometimes could open a drawer to find more information. It was the first museum especially for children, started in 1993. But after the start it was not renewed, and therefore went behind other museums. Because of this attendance declined. What was your first intention with the museum, what kind of museum did you have in mind to realize? The board had decided that the new museum had to move to on other part of the building. Because of that, we had about 1.000 square meters to build the museum. From day one, I knew that it should be an ultra modern institute, with a lot of AV (Audio Visual) Installations and other New Media techniques. The aim of the museum is of course not the equipment, but take children into a magical world. In a virtual and digital way that is a lot easier than just with letters and words. Letters are imaginary, a collective, the alphabet. That’s is just what it is. Could you tell what a child, when visiting the museum, has to do? First of all, there is a story behind the exhibition. There is a monster called Inktvraat (ink corrosion). A term about acids in old ink that affects the paper. This monster is eating all the stories, and the children are able to temporarily stop him by writing more stories. In this way the monster is getting sick, which slows him down. They can’t defeat him, because otherwise they won’t come back to write even more stories. There is a little difference if a child visits the museum with his parents, or with the whole class from school. 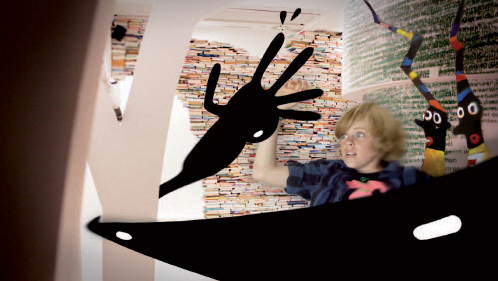 But the basic idea is of course the same: writing a story and a character to defeat Inktvraat. At the starting point they receive brightly colored bracelet, which contains a RFID chip. With this bracelet, they can collect words or fragments from the exhibition to create their own story. Because the words are inside the bracelet, they’re digital and unreachable for Inktvraat. There is also a virtual, androgyny character in the bracelet, the main character of the story the child has to create. By doing games and puzzles the child is able to give his or her character some clothes, an emotion and an environment to live in. The museum, which is a magical world, looks like rice fields. 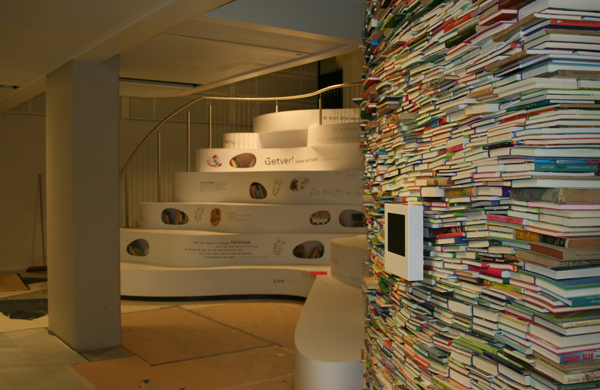 Instead of rice there are words and a lot of books. There are 6 ‘caves’ where the child has to learn something. The three major topics (each topic has two caves to learn about the topic) are emotion, environment and appearance of the character. For example, in a cave you have to play a game. When you finished and won the game, you virtually received a new part for your character. At the end of the subjects, there is a workstation with five touch screens. 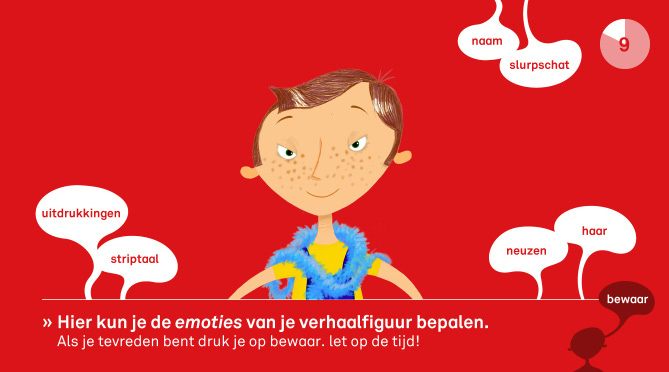 The child has to use his or her bracelet to activate a screen and then create the character with the received parts. When they have done some extra assignments, like listening to an audio fragment, and answered the question raised with the right answer, they’re able to receive some extra gadgets to make their character even more special and personal. After visiting al the different caves and parts of the world of Papiria, the children from schools are taught in a classroom within the museum. They receive a print of the character they created, and will write their story to stop Inktvraat from eating ink from the books. How did you manage everything to get the exhibition as it is today? First we visited other institutes and museums, and talked about the up and downsides of the exhibition visited. The basic concept took about a year to create. I wanted a game element in the exhibition, and that took a lot of time to work out. The exhibition is a alternate game where the children win virtual objects by completing physical games and assignments in the real world. I knew from the beginning that the child had to create his or her own story and character. Of course you’re able to just show how a writer works, but it is important for children to do things themselves. In the heritage sector is a change going on, from “walking trough a museum with your hands on your back” to a exhibition where the visitor is actively participating. One important aspect is the break-up of the museum. The six caves mentioned before are actually stretched out in two groups of three caves. If one side of the exhibition is not working due to a technical problem, the other three caves are still working, as they should be. That’s really important in a big exhibition with this much of computer-based components. Why did you choose for the new media way? Is it because young people would think it is cooler? Children, especially on this age, have a very short attention span. They are really impatient. With all the new media parts of the exhibition the children went to work for themselves, with the underlying motive of winning virtual items for their own story and narrative figure. Research showed that children actually want to return to the museum to play again and again, to create another story and another character. It is a drive to pass through it, and it appears to work very well. It’s not just the game that makes it be interesting. It is the whole, the epic environment. The world is overwhelming, as a child you get into another mindset. In this way it is working for them. 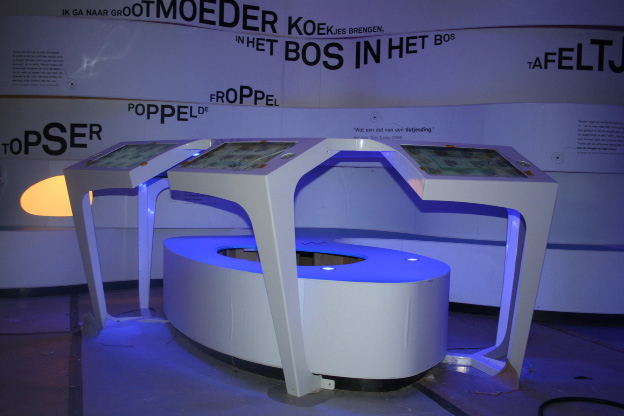 There is a lot of technical stuff used in the museum, isn’t that too difficult for children? In general, the children are very quickly in how it works, often faster than their parents or guardians of school. These are parents who sometimes grumble that they do not understand how it works, but the children pick up quickly. The only thing proven is not a technical difficulty. Children are increasingly impatient. They cannot even peacefully watch a 1.5 minute movie. It’s too long, but the older they are the better they can. Little children have very short attention span. Another part consists of an actual picture along with an explanation in sound, but this is seen as boring. Listening and watching a still image is too boring. I think they are already accustomed to zapping informative to get themselves. As you just said, children are easier going with the used techniques than their parents. This museum is especially for kids, but would a multi media exhibition work for other museums as well? There are more and more generations who can deal with interactive exhibits, but it will depend upon what sort of museum. You shouldn’t replace paintings by Pablo Picasso with a digital screen on which you show the picture. But this can be used for interactive tablets to add informative. But this is already applied in several museums. I’ve read an interview recently, about the new maritime museum in Amsterdam. They used also much interactivity and AV installations. People complain that there is no moment of silence anymore in the museum. You’re always be distracted by sounds or moving images if you want something to take a look at. In the children’s museum, we try to limit noise and local audible, so that they do not interfere in other places. There is a precarious balance of what people experience as pleasant and spectacular, and when people are fed up and tired, when there is an overkill. « The end of television as we know it?